There are two ideal format for artwork, which depend on what is to be printed onto the bag. If the bag is to be printed CMYK (process printing) with an image or photo, we can accept a large image file of any of the following formats: JPG; TIFF; PNG; GIF. The larger the file, the better the finished print will be. If too large to email, files can always be sent over via CD/DVD or FTP. 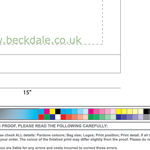 We will then provide a PDF (low resolution if emailed) for you to approve prior to printing. It is possible to have a pre production print sample, however, there is usually a cost associated with this. If the bag is to be printed using spot or pantone colours, artwork is required in a vectorised format. This essentially means that each shape, letter or part of the logo, is defined within an illustration program as a shape outline. This allows us to produce printing plates for each colour. Artwork can be supplied in a non suitable format and we can, subject to the technicalities of the design, transfer it into an outlined format. As with the process print, you will be provided with a PDF to approve prior to printing. When supplying artwork, it helps if you can specify or attach the required fonts. All artwork is best supplied in an Illustrator format, either *.AI or *.PDF. Most other formats can be used and converted. We offer a design service for printed artwork formats. Our in house sales staff have the knowledge to help shops select unique artwork formats. To discuss choose by material or similar , connect with Beckdale via your preferred method.